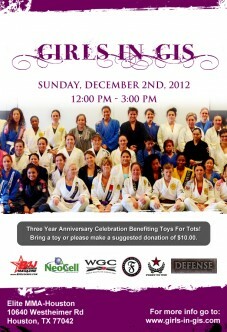 Girls in Gis is proud to announce the GIG three year anniversary celebration event! This celebration will take place December 2, 2012 at Elite MMA in Houston Texas. Hosted by GIG Founder Ashley Nguyen. Join us for the largest event of the year. Come celebrate with friends and get your roll on. We will be doing a toy drive for Toys for Tots. Please bring a toy or make a suggested donation of $10. Come celebrate with friends, give a gift to those in need and get your roll on! Sponsors include: Fenom Kimonos, BJJ Legends, Neocell, Defense Soap, F2W & WGC and Resist Attack.